I have played a myriad of war games in my day, though my personal favorite will always be Wolfenstein, if that counts. I was never very good at flight simulators or combat games when utilizing PC controls. I am just dreadful for some reason, and all I do is take off and then crash again. 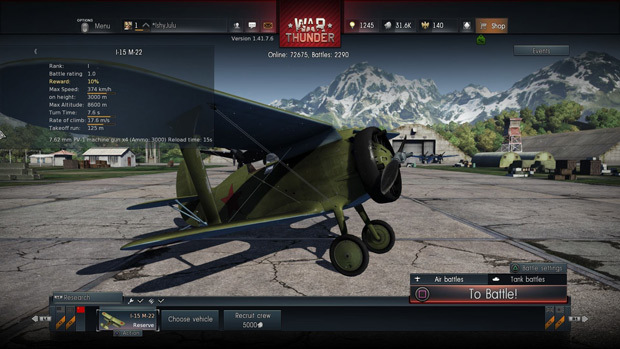 So when I was given the PS4 Beta for War Thunder, I was pretty excited. Using a controller, surely I could take to an aircraft and defend Russian skies! Oh, how wrong I was. I did however manage to drive up fuel costs across the Soviet Nation, I’m willing to bet. 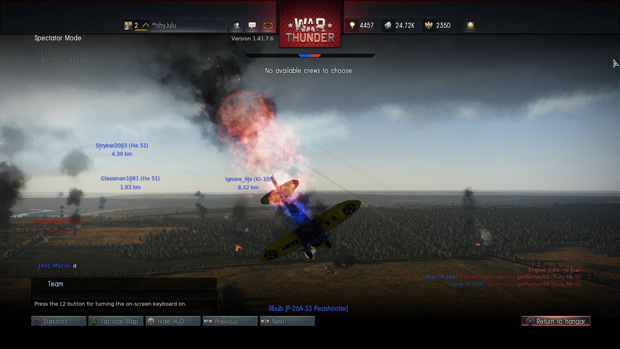 War Thunder is a unique war game, unlike World of Tanks, as it also offers aerial combat (which in my opinion is the core gameplay. Ground-based combat isn’t bad, but it doesn’t yet compare to the dogfights). It does not focus solely on World War II, which is far overdone, but the bulk of vehicles are from the WWII era. Though the beta does not feature them, there are possible micro-transactions, such as purchasing some of the vehicles or the “Pro” service, which gives boosts to currency and experience points. These are not necessary in the least, and one can easily enjoy the game playing it for what it is, a free PvP shooter. But the Advanced Pack does include the Campaign, which is one of the big draws to this title. 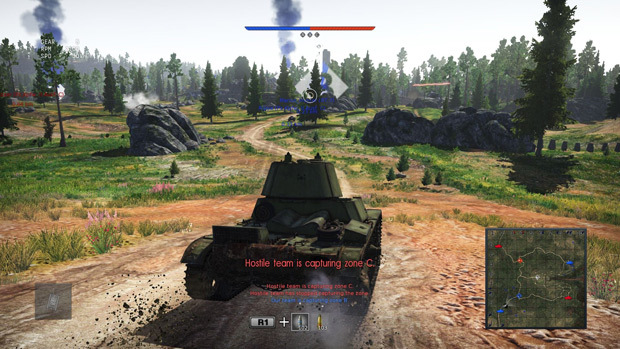 In addition to simply doing battle in dogfights or ground-based tank battles, there are a series of campaign missions, dynamic and changing that take place across the battlegrounds in Europe. Better yet, they offer a large focus on a portion of the war that does not get a lot of video game coverage: The Pacific Campaigns. There is so much to see and so many beautiful areas to explore; if you can avoid bullets and rockets long enough, you can admire the world that the fine folks at Choice Provisions brought to War Thunder. 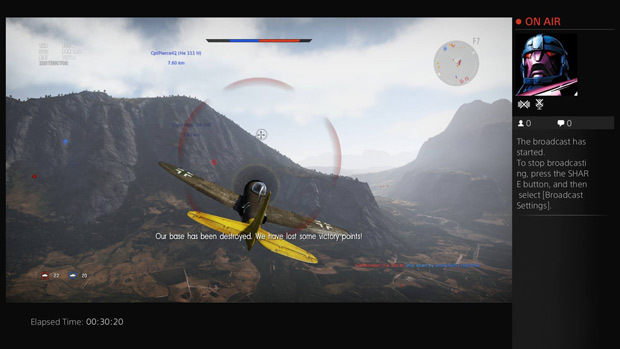 The game is fairly true to life, which I certainly noticed as bullets sheared off wings to my planes; moving up too high too fast caused enough G-forces to make my pilot black out and crash; tanks being stuck in ditches and unable to scale hills that are too steep; and blasting fuel lines so tanks and planes alike erupt into a column of smoke and flame. It’s a beautifully crafted game and this beta brings with it some fascinating, and wonderful news: the PS4 version is able to be cross-played with people on the PC! Now if only we could get this on more titles. However, there is a drawback to be had here, one minor caveat if you will. Your account for the PC version does not transfer to the PS4, you have to make a brand new account. This is not a big deal to me because I did not have a PC account, but many of my friends do, so now I can play with them on a format that suits me better. 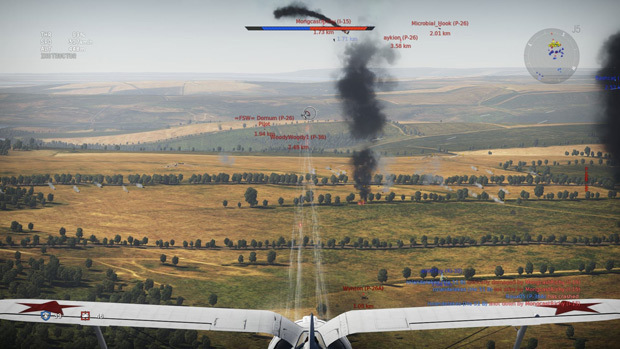 Kudos, War Thunder team! There are benefits for the PlayStation crowd, such as 15% off the premium service for PS+ members, and also an exclusive DLC with US attack plane A26-C Invader. Going into the game, I expected only a handful of aircraft, and not to be able to fly as Italy or other major powers. However there are at present 350 aircraft and 70 ground vehicles in the game, with more on the way in future updates. So there are tons of choices, and you really cannot go wrong with whatever you choose. Granted, though your starting craft (if you play for free) will probably be uninteresting, patience is a virtue. Eventually you will have slick fighters that pack rockets, or heavy, swift armored tanks with shells that shred anything in your path. The tutorial will help immensely, giving you missions to learn how to fly and fight, appropriate distances, and target the enemy. It will go over many important things to make the game easy, and I for one am glad that I went through them. It will make you aware how planes function differently from each other, and how to use different views from the cockpit, which I really enjoyed. Personally, I found tank piloting to be a bit of a chore. It is well designed but incredibly clunky, much like a tank is. Many of the missions I piloted a tank in I found myself caught in ditches, trapped against rocks or hills, and unable to progress without leaving the vehicle, meaning it cannot be used further in that battle. It was troublesome, and I really feel aerial combat is fleshed out better, but the developers are constantly working to make the game better, so I feel this will only get better with time. While there aren’t dozens of different mission types in PVP combat, each time I took the skies or the ground I always felt like each mission required different approaches and strategies, because players will always react differently. A lot more thought went into battle than I initially expected. Another core mechanic that should be addressed is Research. You research new technology or upgrades to your current technology that you can use in combat. You simply do not get to start off with an M1 Abrams tank or anything like that. You gain Research Points or RP by going into battle against other players. 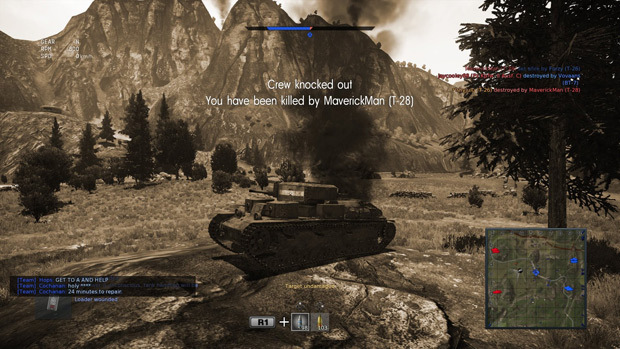 The amount you get after a battle is the result of several in-game factors such as victory or defeat, activity (were you with the squad, or did you just crash and burn immediately? ), first victory of the day bonus, and whether or not you were actively completing objectives (blowing up ground targets, holding choke points). Premium accounts also gain more RP in addition to all other factors. There are tons of aerial shooters, and many more that are devoted to World War II. But what makes this one in particular stand out? The primary theater is that of the Pacific, the US/Japan battles out in the East Seas. Instead of the usual European theater (which is still there, the first missions I did were as a member of the British Royal Navy), there are many new and intriguing places to do battle at and blow stuff up around. I do not feel the Pacific theater of operations gets enough attention as a part of World War II, because everyone wants to shoot Nazis. Not that I think this is a bad thing. For those who are unfamiliar, a “theater” in this instance is the place where combat is taking place, aka a military operation. There are two single player campaigns available here for those who purchase them (and they come highly recommended) and there are also really amazing cutscenes using real WWII footage; kind of felt like I was interacting with the History Channel. There are also other scenarios and campaigns that can be completed alone, or you can bring up to three friends with you to compete with/against. Again, you can play with people who are on PC and Mac, but you cannot use your PC/Mac account on the PS4 edition of the game. The social tab is where you can add their nicknames and invite them to join the chaos with you. What makes this particular war game so interesting is that unlike other shooters, such as Call of Duty and Battlefield, you have a limited number of tries to go into battle. If your hangar only has say, four slots for aircraft, and all four get shot down, that’s it; your tour of duty is over. 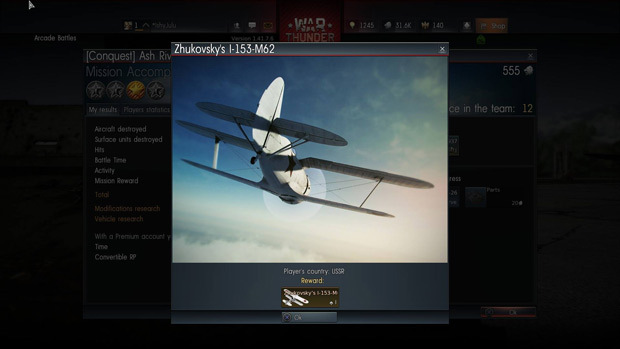 You can use in-game currency to get a few more slots for tanks and airplanes, but be aware that you do not get infinite tries. I sort of liked this because it really gave me pause to consider what aircraft I was going to use, and to try not to fly off on my own like I was in Top Gun. Use The Boost To Get Through! Did you really think I would review a game about aerial combat and not stick something about Star Fox in there? All in all, I really think this title is doing a bang-up job of providing realistic combat; sometimes too realistic and that can be infuriating, but sticking to one’s guns is important. I do feel like the purchase for the campaign might be stretching, but after playing through a chunk of it, I feel it was certainly worth the purchase. They are working hard to add more content and more interesting designs for their ships, and with any luck, they will expand before and after the WWII/Korean War era. It’s a lot of fun, and I think just about anyone can pick it up and have a good time. This game is beautiful. There is not enough I can say about this game; it is stunning, and everything about it is just crafted fantastically. I can see the smoke billow from the damaged parts of my vehicles as bullets whizz into them. Each map is well designed, and I occasionally get distracted by how delightful it looks. 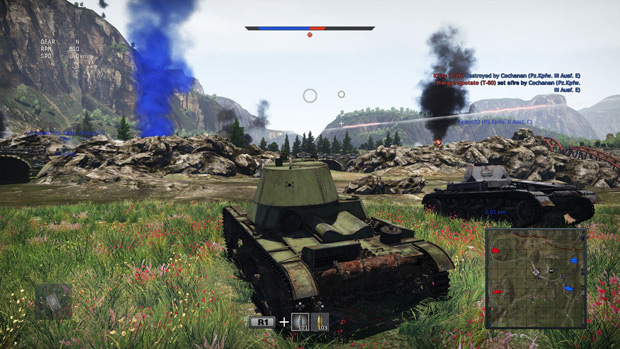 Each vehicle is unique and true to form from its historical counterpart, and the cut-scenes of the WWII combat are tasteful. 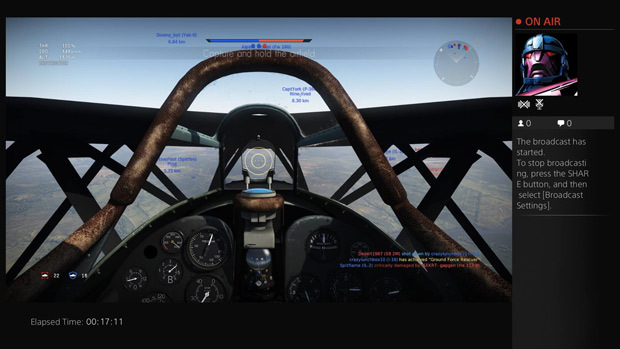 Most of the controls are pretty easy to use in War Thunder. Not a big fan of the tank piloting again, and found myself struggling to get to the objectives. Combat with a tank was incredibly gratifying, and sniping another tank from a jungle of trees and bushes felt so very, very good. The controls are a little weird to get used to, but the tutorial helps you acclimate yourself a great deal. There are not many different modes to play on, but they are all well-fleshed out and fun to play. The campaign is a blast, and though I do not have many friends that I play with, I love the notion of being able to play multiplayer campaigns. That is a huge draw for me, and I really enjoyed every game type I played. The sounds and music of this game are pretty great, but can tend to drone on after a while. I need a little variation. But I love the sounds. The whirr of airplanes, the chunk! of tank shells blasting into metal armor, and the violent explosions of crashing airplanes were so impactful. There are a lot of things to hear, and the constant changing stimulus is pretty fantastic, even if a little distracting. Catch some actual gameplay footage from my review time below! Nexon America and WeMade Entertainment invite players to Riders of Icarus, an upcoming free-to-play action-adventure MMORPG.